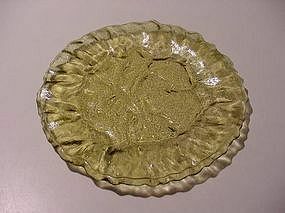 The Crinkle pattern was produced by Morgantown glass company in the late 1930's and into the 1960's. This is the 7 1/2 inch plate in topaz. This is the older style plate that used the original 1930 El Mexicano mold upon which this pattern is based. I have 14 available in topaz, price is per plate. I also have 8 available in green that match the juice tumblers I have listed. The green plates are $24 each. See my other listings for more Crinkle items in different colors. The Crinkle pattern was produced by Morgantown glass company in the late 1930's and into the early 1960's. This is the 4 inch berry bowl in amethyst. This size bowl is very difficult to find. Perfect condition, I have 12 available. Price is per bowl. See my other listings for matching Crinkle items to complete your amethyst table setting, as well as others in different colors. The Crinkle pattern was produced by Morgantown glass company from the late 1930's and into the 1960's. 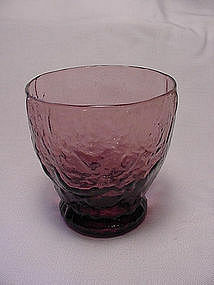 This is the 5 1/2 oz cocktail tumbler in amethyst. Perfect condition, I have 7 available, price is per tumbler. See my other listings for matching Crinkle items as well as others in different colors. 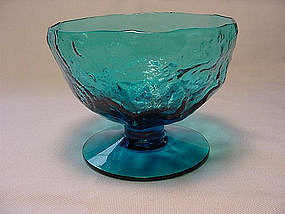 The Crinkle pattern was produced by Morgantown glass company in the late 1930's and into the 1960's. This is the 13 oz footed tumbler in green. The tumbler is 5 1/4 inches high and in perfect condition. I have 8 available, price is per tumbler. See my other listings for more Crinkle items in different colors. The Crinkle pattern was produced by Morgantown glass company in the late 1350's and into the 1960's. This is the 6 1/2 oz tumbler. The tumbler is 4 inches high and in perfect condition. 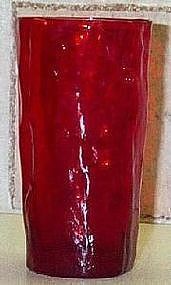 I have 7 Ruby available, price is per tumbler. Please specify what you'd like. 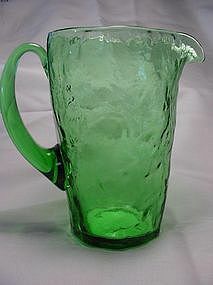 See my other listings for more Crinkle items including the matching pitcher for these glasses. The Crinkle pattern was produced by Morgantown glass company in the late 1350's and into the 1960's. This is the 6 1/2 oz tumbler. The tumbler is 4 inches high and in perfect condition. I have 18 amethyst and 6 green available, price is per tumbler. Please specify what you'd like. See my other listings for more Crinkle items in different colors. 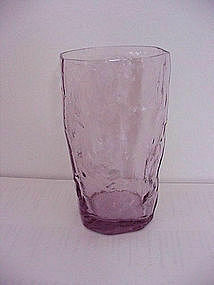 The Crinkle pattern was produced by Morgantown glass company in the late 1930's and into the 1960's. 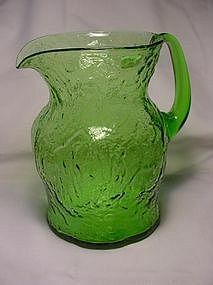 This is the 80 oz 'Ockner' pitcher in green with an applied handle. The pitcher stands 8 1/4 inches high and is in perfect condition. See my other listings for matching tumblers and other Crinkle items in different colors. 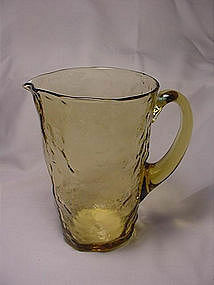 The Crinkle pattern was produced by Morgantown glass company in the late 1930's and into the 1960's. Offered here is the very hard to find liquor glass in pink. This glass is small - 2 5/8 inches high - and is the shot glass of the Crinkle line. Perfect condition, here's your chance to add a rare tumbler to your set. 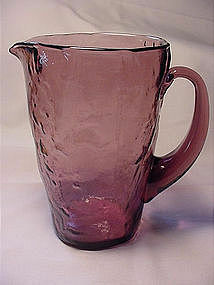 See my other listings for a matching pitcher and other Crinkle items in different colors. 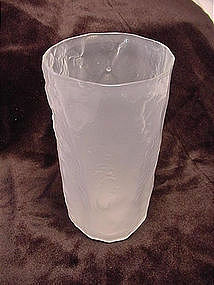 The Crinkle pattern was produced by Morgantown glass company in the late 1930's and into the 1960's. 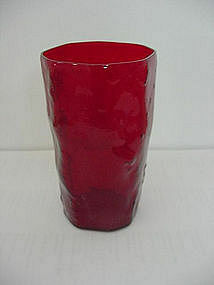 This is the 12 oz tumbler in ruby. The tumbler is 5 inches high and in perfect condition. I have 7 available, price is per tumbler. See my other listings for matching tumblers and other Crinkle items in different colors. The Crinkle pattern was produced by Morgantown glass company in the late 1930's and into the early 1960's. This is the footed sherbet. I have 8 amethyst,and 4 topaz available. Price is per sherbet, please specify what you'd like. See my other listings for matching plates and other Crinkle items in different colors. 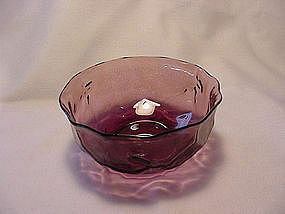 The Crinkle pattern was produced by Morgantown glass company in the late 1930's and into the early 1960's. This is the footed sherbet in Peacock Blue. I have 8 available, price is per sherbet. See my other listings for matching Crinkle items, as well as others in different colors. 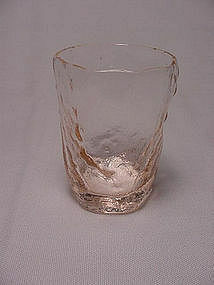 The Crinkle pattern was produced by Morgantown glass company in the late 1930's. 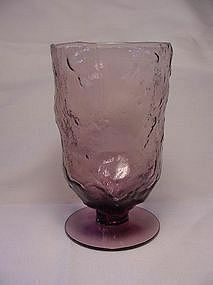 This is the 6 1/2 inch high juice or martini pitcher in amethyst. The style is called 'Tijuana' and it holds 34 oz. Perfect condition, see my other listings for matching tumblers to complete the set - and for more Crinkle items in different colors. 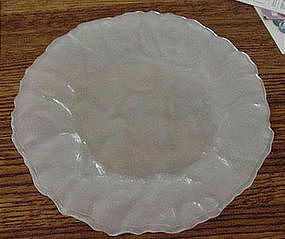 The Crinkle pattern was produced by Morgantown glass company in the late 1930's and into the 1960's. This is the 6 1/2 inch high juice or martini pitcher. The style is called 'Tijuana' and it holds 34 oz. Perfect condition, see my other listings for matching tumblers to complete the set - and for more Crinkle items in different colors. 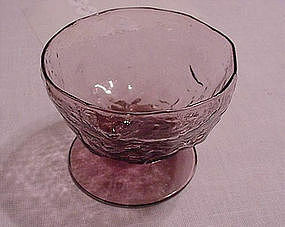 The Crinkle pattern was produced by Morgantown glass company in the late 1930's and into the 1960's. This is the 6 1/2 inch high juice or martini pitcher. The style is called 'Tijuana' and it holds 34 oz. Perfect condition, see my other listings for more Crinkle items in different colors. 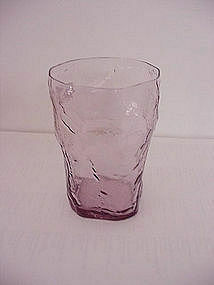 The Crinkle pattern was produced by Morgantown glass company in the late 1930's and into the 1960's. This is the 8 oz tumbler in amethyst. The tumbler is 4 1/4 inches high and in perfect condition. I have 12 available, price is per tumbler. See my other listings for more Crinkle items in different colors. The El Mexicano pattern was designed to look like old, crudely made Mexican Glass. Made by Morgantown Glass in the early 1930's, the molds were later reworked for their crinkle line. 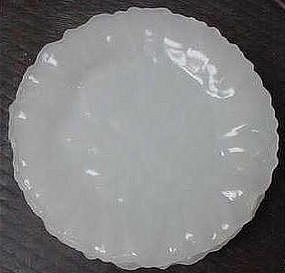 This 9 1/4 inch dinner plate is circa 1932 and the color is called 'Ice'. Perfect condition, I have 3 available. Price is per plate. See my other listings for matching salad plates in this pattern. The El Mexicano pattern was designed to look like old, crudely made Mexican Glass. Made by Morgantown Glass in the early 1930's, the molds were later reworked for their crinkle line. This 7 1/2 inch salad plate is circa 1932 and the color is called 'Ice'. Perfect condition, I have 4 available. Price is per plate. See my other listings for the hard to find dinner plates in this pattern. The El Mexicano pattern was designed to look like old, crudely made Mexican Glass. Made by Morgantown Glass in the early 1930's, the molds were later reworked for their crinkle line. This 5 1/2 inch tumbler is circa 1932 and the color is called 'Ice'. Perfect condition, I have 4 available. Price is per tumbler. See my other listings for the hard to find dinner plates in this pattern.